At the risk of stating the obvious, being the father of a kid with Down syndrome is different to being the mother of a kid with Down syndrome. I say this not as someone who has experienced both perspectives (having never been the mother of a kid with DS), but as someone who has realised that we all have different ways of viewing and engaging with the world, and things just work better if we recognise and support each other in these differences. Even better yet if we are able to see and use these differences as a source of combined strength and resilience. As a man, pregnancy and childbirth has always mildly terrified me, and the diagnosis (are you allowed to call it that?) that my wife was pregnant with our third brought with it that now familiar knot of anxiety. She on the other hand ascended into a Zen state of quiet satisfaction as her world continued to shape itself quite nicely indeed into the vision she had always had for it. 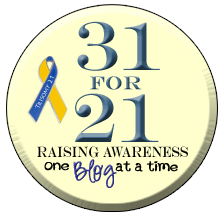 When we received prenatal confirmation of T21, neither of us coped overly well. Her world of quiet satisfaction and confidence came crumbling down, as my fears and anxieties were given a name and began to crystalize before my eyes. I don’t think I have ever cried so much in my life, and hope I never have cause to again. My world splintered even further as I felt my wife and I moving apart and becoming isolated from each other as we each worked through the process of grief in our own way. I felt about as isolated and lonely as I think a person can feel. I desperately needed emotional support, but the one person who I needed the most was not there for me. She was too busy fighting for her own sanity to help with mine. As I watched her spend time with her family and friends, talking, coming to terms with our news, forming opinions and making decisions, I became even more isolated. She didn’t need me. She had an amazing support network around her that had nothing to do with me, nurtured with care and devotion over the years, and now proving its worth. I had no such thing. As with so many men, I had committed so fully to my work, my wife and my children, that I was now stranded without any hope of the perspective or support of others. Or so I thought. At the point where my days were darkest an old friend who I rarely see reached out to me. I spent the next two hours pacing my back yard, confessing my deepest fears to him on the phone, half the time unable to speak through the tears. After this I was still not alright. But a light had been turned on. I could start to see that I wasn’t as alone as I had once felt, and I could start to hear the words of concern and offers of support around me. My world had splintered and fallen apart. I had become lonely and isolated not only from others, but from my wife. But now we began to move towards each other again and we lent in. We rediscovered each other. We were now able to start to see the world around us once more. We were able to listen to each other’s fears and hopes, and to see the differences and the similarities, draw strength from that and start to move on. Having a child with Down syndrome has changed who I am, and how I see the world. It has given me perspective and empathy, love and resilience. It has brought me closer and strengthened my relationships with my children, wife, parents, family, friends and neighbours. It has shown me who will reach out when I need help, and who won’t, and importantly, it has taught me that needing and accepting help is not a sign of weakness. By day, Ben runs Grassroots IT in Brisbane and by night, he transforms into Daddy-love. If he can squeeze any time in between his family and his business, he loves running, gardening and photography (when he can wrestle the camera from his wife’s hands ;). Photo credit for first image: Kathy Corcoran.